When you think of the iconic animals of Africa, the lion is probably on the top of your list. Sadly, according to report by conservation group LionAid, a total of just 640 lions remain in all of western and central Africa. Already extinct in 25 African nations and disappearing in 10 others, the catastrophic decline in lion populations can be attributed to high levels of poverty, an undeveloped wildlife tourism industry, and a lack of political interest in conservation. Countries such as Nigeria have as few as 34 individuals left, making it virtually impossible to rebuild a population from such a small number. Researchers from Duke University have noted that a full three-quarters of savannah habitat has disappeared in the last fifty years, estimating that only 32,000 lions remain on continent. LionAid says they believe that the number is probably in fact far lower. Trying to gauge the exact number of lions remaining in west Africa is difficult. Each animal needs to be lured with bait and photographed from both sides to avoid duplication. Hard enough a task as it is, the funding is simply not available to generate a precise number. Even so, many conservationists believe that the LionAid projections are accurate and the situation is dire in countries such as Niger, Burkina, Chad, Cameroon, and the Central African Republic. Last year, US the Fish and Wildlife Service, which is the largest importer of trophy-hunted lions, said it would review whether or not to put the lions under the protection of the Endangered Species Act. Activists believe that between 1998 and 2008 over 5,600 lions were killed and exported. 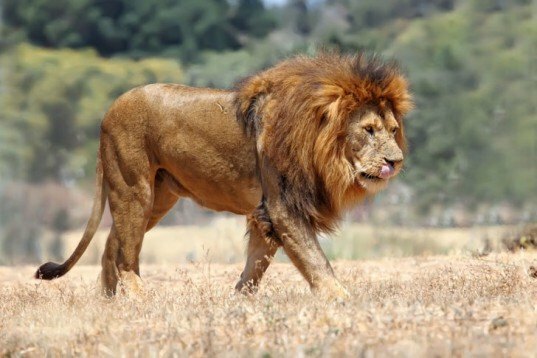 While Asiatic lions, with only 200 cats remaining, are listed the African lion has yet to be added. Many are calling for stricter regulations on the trafficking of lion parts in light of the rapidly declining numbers. An icon of the land and integral part of cultural heritage, the lion is disappearing from the wild in Africa.